Ink drawing of a stone 'found 10 foot underground in Micklegate York in 1747'. 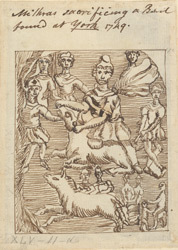 It has an image of Mithras sacrificing a bull at the vernal equinox. Mithras was one of the Gods worshipped by Romans living at York. They not only worshipped their own gods, but also British gods and in this case the Persian god Mithras. The cult of Mithras was popular in the Roman army and the few Mithraic temples in Britain were in military centres such as London and York.